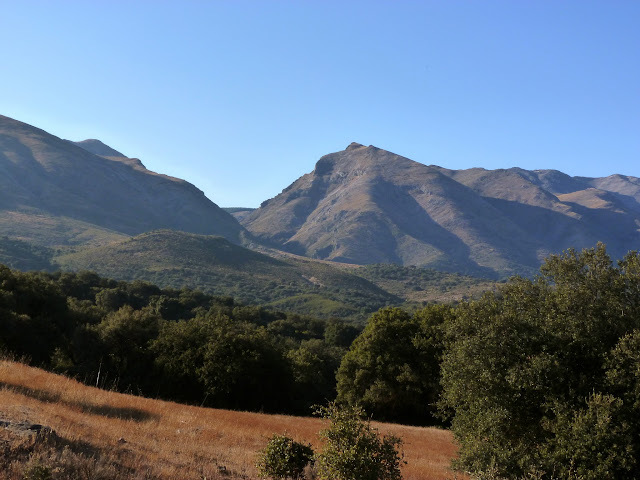 If you decide to walk the E4 and you want to start in Spain, an early choice you have to make is whether to take the northern or southern variant of the GR7 through Andalucia. With no great application of science I chose the northern option. Checking if this was the best option was just the excuse I needed to return to Spain and in October, five weeks after finishing my E4 trek in Budapest, I was on my way back there with Christine. I only had 9 days which isn’t long enough to do the whole variant. The GR7 splits into two at Villanueva del Cauche in Malaga and doesn’t join up again for 450 kilometres (at Puebla de Don Fadrique). I figured I would need at least 15 days to do the whole stretch. To help me decide which bit to do I turned to Juan Holgado. I had met Juan in March on my second day out of Tarifa on the E4 walk. This was an amazing coincidence and a real stroke of luck. 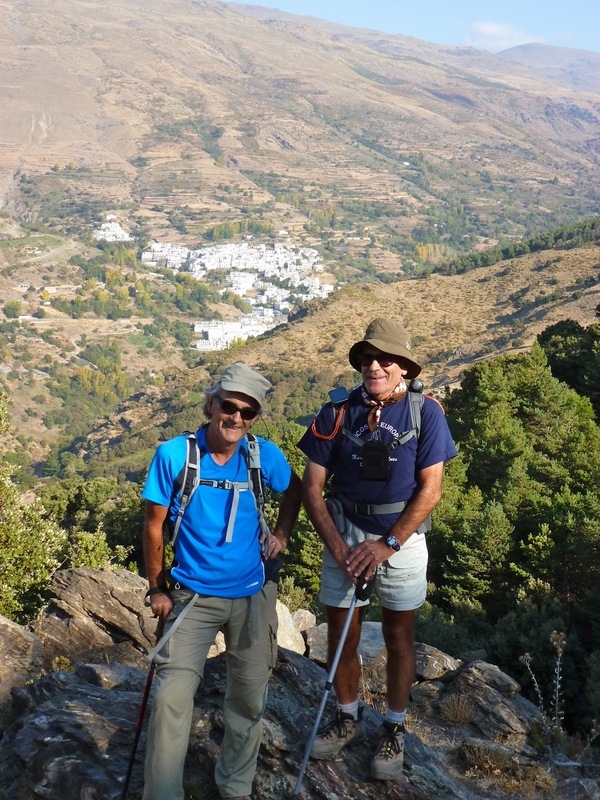 Juan had helped Michele Lowe and Kirstie Shirra write their guide “Walking the GR7 in Andalucia” and is the expert on the GR7 and all things walking in Spain. He has his own web site (www.jaholgado.com). Although we only spoke for a few minutes we struck up a friendship and Juan, through comments on my blog, advised and encouraged me all the way across Europe. 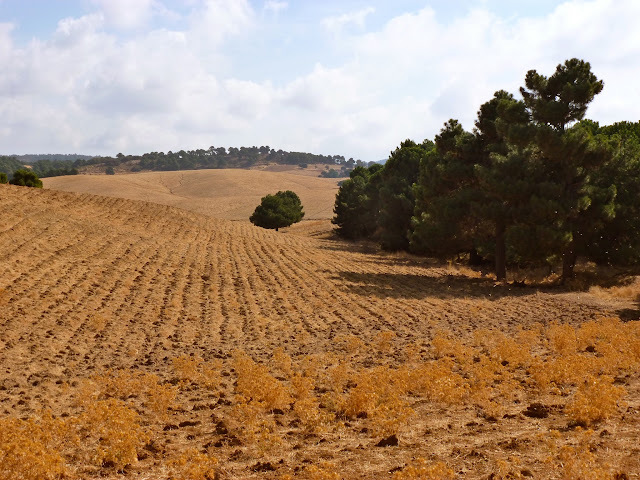 Juan suggested that the best 9 days walking along the southern variant are from Ventas de Zafarraya to La Calahorra. This meant dropping the two day stretch in Malaga province, and avoids the La Calahorra to Narvaez section which doesn’t have any accommodation. As well as getting Juan’s advice I also managed to persuade him to join us for the second half of the walk. It was going to be interesting to find out whether, having only talked face to face with Juan for 15 minutes, we would still be talking after 5 days! There are a couple of fairly obvious things to say about the southern variant. First, the route is on the southern and eastern sides of the Sierra Nevadas and these huge mountains, the second highest range in Europe, hide you from the damp Atlantic air stream. It was a surprise to me to discover in March, on the northern route, that I was walking through some of the wettest parts of Spain; in October, on the southern side, the weather was much better. Second, the southern side is a more popular walking destination. To be honest that had initially put me off but one of the things I have learnt from my trip across Europe is that popular for walkers doesn’t necessarily mean crowded - in October at least, it just means you won’t be completely on your own. 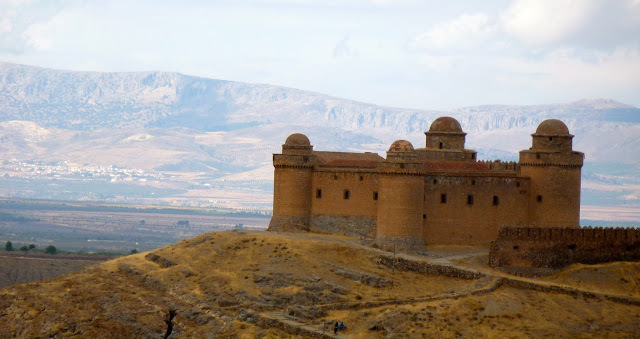 Our trip started on the 14th of October with a flight out from Gatwick to Malaga and a taxi up to Ventas de Zafarraya. I’m a big fan of the Spanish bus service, ALSA, which has a fantastic web site but unfortunately it didn’t have a route to our starting point so we had to get a taxi from the airport. I booked this online from home and was very impressed with the service. We got to Ventas de Zafarraya at about 5.30pm and were instantly reminded of all the ups and downs of Spanish budget accommodation. The restaurant, which looked really interesting, was only open at mid-day and even the bar was shut in the evening. After a couple of beers and some tapas, it was down to the tiny village supermarket for chocolate and biscuits. We also missed breakfast, which was much too late for us, so we posted the key through the door and left early hoping (in vain) to find somewhere along the way. Dramatic scenery to start with but the rest of first half of the walk, through intensively farmed and messy countryside with a poorly waymarked path, was not very impressive. After a restorative lunch at a roadside restuarant at Los Canos de la Alcaiceria, the walk along a forest road improved as we approached Alhama de Granada. The last bit took us through a dramatic gorge to the town wonderfully located at the end of the incision, high up on cliffs. 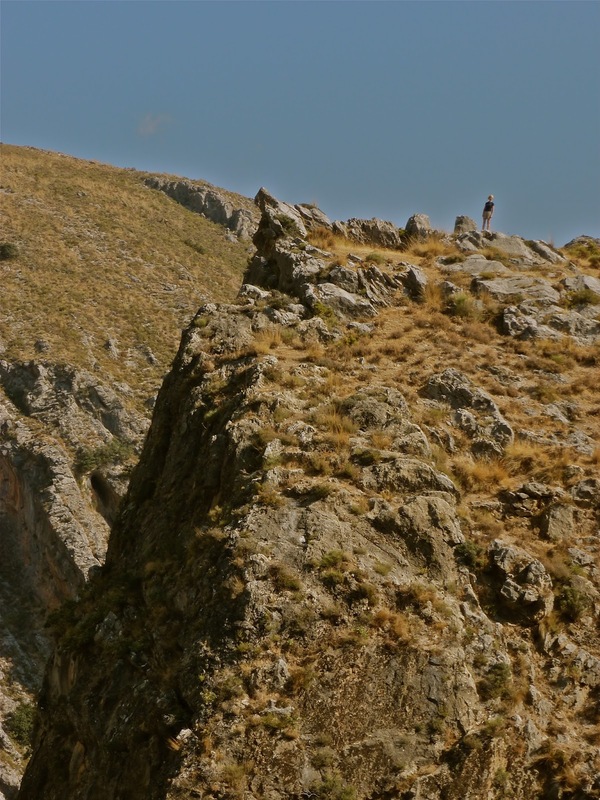 We dropped our bags at our overnight stop, the Hotel el Ventorro - a lovely spa and cave hotel at the beginning of the gorge, and this shortened our walk next day by a couple of kilometres. After clouds and mist on day one, the weather improved and was good until the last day of the walk. It was cold however as we left the hotel in the dark on the second day, but soon the morning sun was highlighting the lovely burnt out colours characteristic of an October walk in Andalucia. It was a long walk to Jayena and after some amazing views of the Sierra de Almijara things got a bit dull as the olive trees increasingly dominated the landscape. If I had gone the right way, the afternoon would have better but after 10 hours walking we were knackered as we walked into Jayena which, like us, was a bit down at heel. 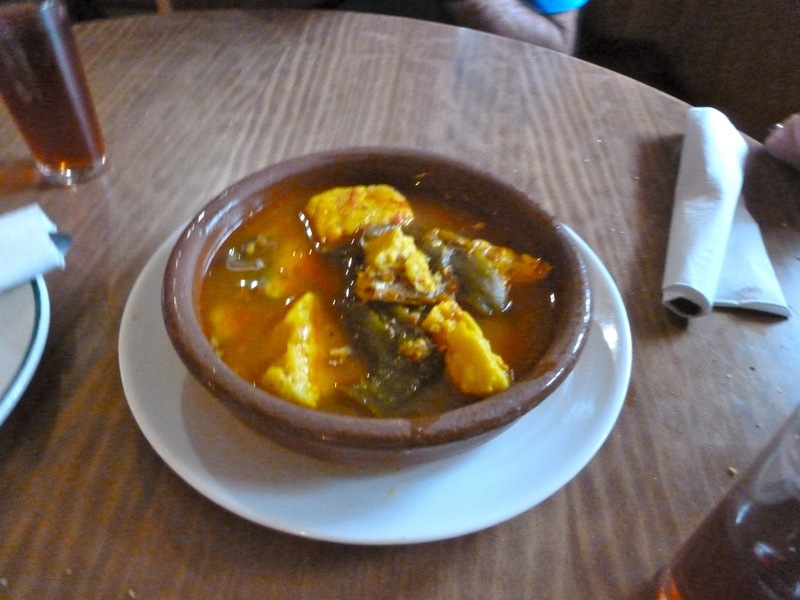 Stayed at the Hospederia la Almijara and had some amazing food in the local bar which completely revived our spirits. The walk next day to was excellent, away from the olive trees and into the Alimijara y Alhama Natural Park. The first stretch was through a forest of natural Corsican pine involved a gentle climb along a forest road before arriving at the open plateau at the top. Had an amazing lunch at the Meson los Prados and a short climb up a road and over a ridge the route took us down along and increasingly dramatic gorge all the way to the town Albunuelas where we were looked after in an English bed and breakfast at La Casa Azul. After walking further down the valley from Albunuelas, the route and the waymarking gets confusing. The route has clearly been changed to make way for the new motorway before Niguelas and some of the waymarks had been vandalised. Once you get above Niguelas on the way to Lanjaron, its a fantastic walk contouring high up and with huge views. You pay for it of course and the walk down to the spa town, past sulphurous springs, is steep and seems to take forever. 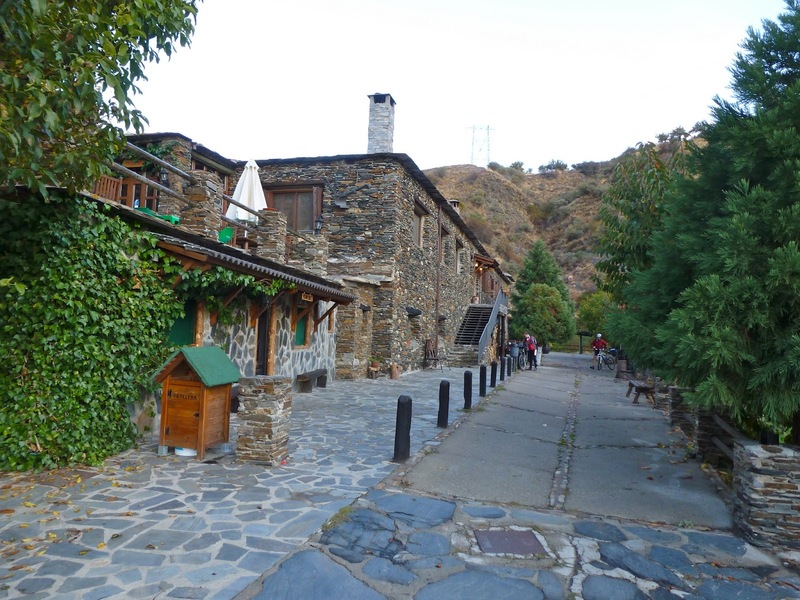 Lanjaron is a holiday town, has loads of accommodation, and if you have even less time than we did, the starting point for a shorter walk in the Alpujarras. We met up with Juan at Lanjaron. The walk next day to Bubion is a great one with the route continuing along a high contouring trail dropping down just a bit as it visits a series of Andalucia’s characteristic whitewashed villages - Canar and Sopurtujar before the final and perhaps most famous trio of Pampeneira, Bubion and Capileira (above Bubion but not on the GR7). We stayed at Hostal des Terraces which has wonderful views across the valley and which turned out to be the same place Christine and I stayed at in a first visit to Sierra Nevadas 15 years ago. Next day is more of the same with the immaculately kept villages of Capilerilla, Pitres, Atalbeitar, Portugas and Busquistar following in rapid succession. A landslip had destroyed the trail on the final approach to Travelez, a wonderful mountain town famous for its jamon, but it didn’t detract from an excellent walk. We stayed at the Hotel La Fragua, which is in the higher part of the town and is definitely the place to stay - very much a hotel for walkers. Another lovely walk next day, particularly the climb out of Travelez which was rewarded, eventually, with a view back to Mulhacen, Spain’s highest mountain. 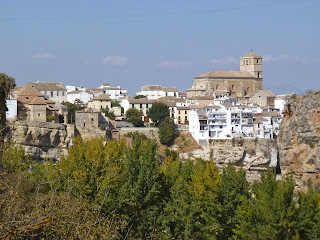 More little white villages and, in particular between Juviles and Timar, some spectacular walking. After Lobras the character of the landscape changes with deeply incised soft sedimentary rock giving it a new and temporary feel. We saw this the next day as well and Christine and I sustained a steady but unresolved debate about its origins - is it: (a) wind blown loess from the Sahara (Christine’s theory); or something more local (John’s theory); or (c) neither. Given the depth of our geological knowledge the odds have to be on (c). The final climb to Berchules, at the end of the day, was a bit of a strain but the Hotel los Berchules was excellent (although not very helpful in terms of taxi organisation for the next day). We changed the schedule for the last two day’s walking deciding to try and get to La Calahorra in time to catch the bus to Granada. This meant a relaxing day back to Malaga and home - it’s possible to do it from La Calahorra but perhaps a bit stressful. So instead of walking to Bayarcal we walked to Mairena and then got the taxi up to Posada de los Arrieros, a great place to stay on your last night in the mountains. A fine walk but the highlight was definitely lunch in a bar full of local hunters. Great atmosphere helped by Juan’s company and his ongoing lesson on the joys of tapas. A great day, very relaxed with tired joints lubricated with large quantities of local wine. 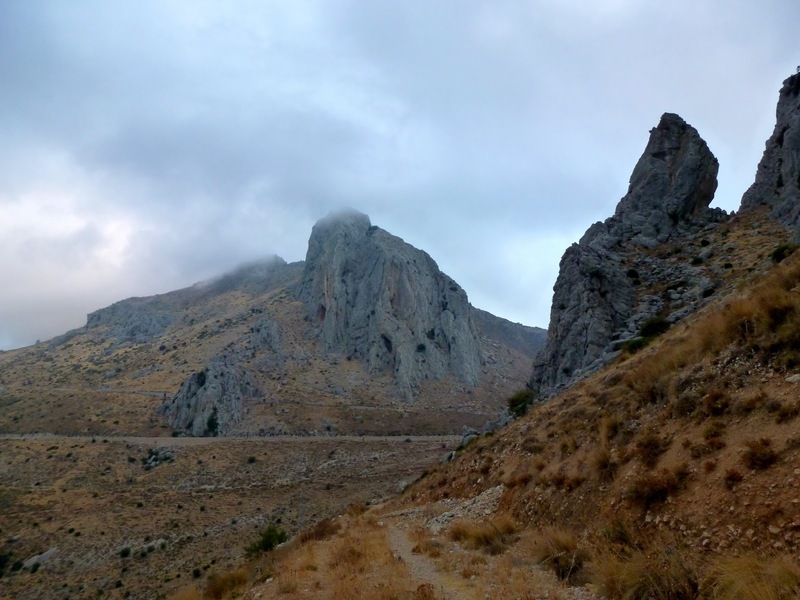 After 8 days of good weather things finally changed as we crossed the pass at Puerto de la Ragua (2042 metres) and made our way 1600 metres down to Ferreira and La Calahorra and the bus back to Granada. It finally stopped raining as we left the bar in Ferreira and shortly after the cloud broke and the first fresh snow of winter could be seen on top of the Sierras. La Calahorra sits majestically on one side of a wide valley and has an amazing sandstone castle with wonderful pepper pot towers at each corner. We should have stopped but all of our thoughts, Juan for Madrid and us for London, were already on home. So which is the best option the northern or the southern variant? I honestly don’t know. For me the best bit of the whole of the GR7 in Andulacia was stretch from Quesada to Santiago de la Espada, really wild and remote and very beautiful, and this is on the northern variant. 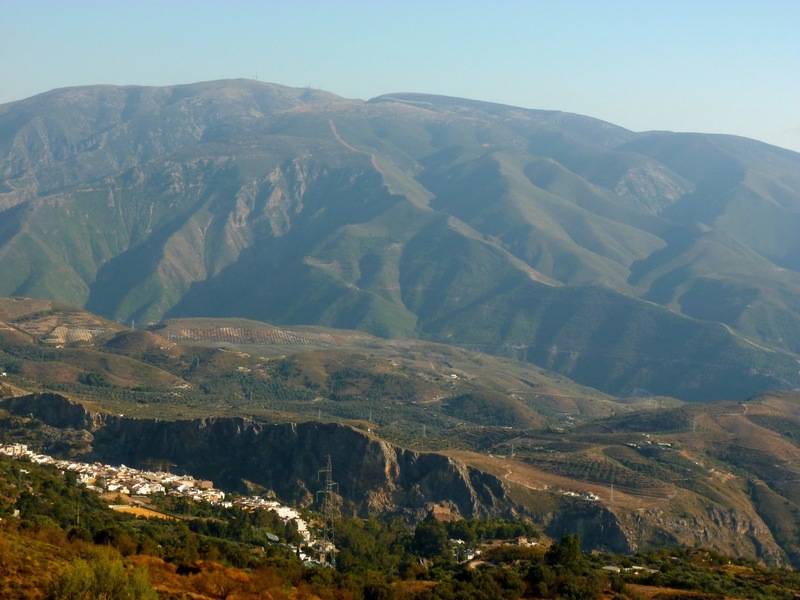 On the other hand the weather is better on the south side and the walk through the Los Alpujarras, the five days after Lanjaron, is excellent. Although I managed to walk from Tarifa to Budapest without local assistance I did enjoy walking in Spain with a Spaniard. Juan was great company, full of local information and sharing the trip with him added hugely to what was already a very interesting walk. Nice bit of countryside, my in-laws live near Ventas de Zafarraya. Btw, you mention Ventas de Zarraya a few times, I've never heard of this place, typo? Hi John. 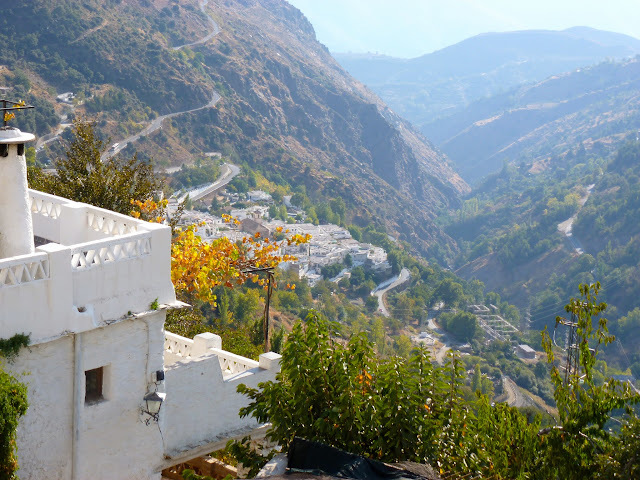 Nice writing of our trip through the Alpujarras. As I told you in a couple of weeks I will start the GR48 Sendero de Sierra Morena from Portugal to the Northern natural park of Seville. 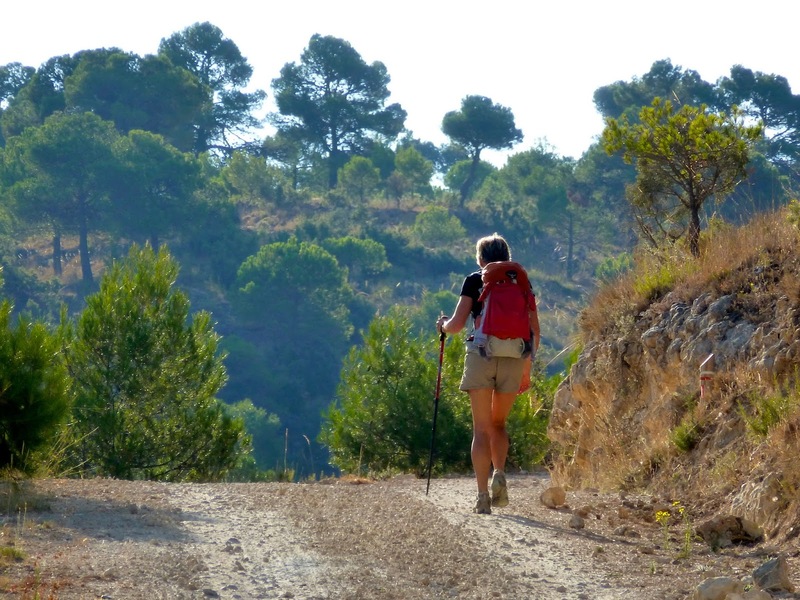 It will be a five day walk on a remote part of southern Spain. So you are invited. Greetings for Christine. I trust she is OK now. First of all, thanks for a great blog! Hi Michael, thanks for the comment. September is a good time to go and you've chosen one of the best stretches. The schedule you have worked out is feasible, but the times in the guide are reasonable as well. I walk fairly long days. Thanks for the feedback. Roughly how long would you spend walking on any given day? (i.e. what's a long-day or a short-day for you?). I know it's all a bit arbitrary, since it depends how fit someone is, as well as whether they walk at pace or walk in a more leisurely way, but a rough indication would be helpful. It really is a personal thing - or two personal things when there are two of you. When I'm on my own really I don't like walking much less than 8 hours. The best walking is at the beginning or the end of the day (the golden hours) and it's nice to walk during at least one of them. I often walk up to 10 hours, but I suspect most people think that's a bit extreme. The key thing is to avoid blisters - I wear trainers (fell running shoes) and haven't had blisters in years, and keep my pack as light as possible (6kilos). Hope that helps. Hi John. Thanks for the insightful post. I am curious if you have any idea how much of this route is paved vs trail vs gravel? In Spain virtually all paths are based on ancient routes. Where they have not been turned into routes for vehicles, either on or off road, than typically it's a fairly hard dry surface. I would say about 75% of the GR7 has not been converted for vehicle access although that's a fairly will guess. Hope that helps and thanks for reading. Thanks, very helpful. My wife and I may be cycling it in November. Now we have to decide on the northern or southern variant. Hi Andrew, I went round the northern side because I was concerned about snow. I think that was a mistake, it was very wet. The route doesn't actually cross the top of the Sierra Nevada so I think you will be OK. There is a Cicerone guide to the GR7 in Andalucia which should help. Thanks for your diaries, really enjoyed reading them. So much so that I´ve been inspired to take up the walking boots myself. Apart from a few day hikes around the UK and a couple of jungle treks in SE Asia, I have no real experience (especially doing a solo trip like the one I´m planning). I´m going to be in Northern Spain towards the end of April and was hoping to cross the border and join up with the GR7 in France however, reading your dairy, the Catalonia section was the worst part of the trail. Do you have any recommendations on alternative routes for a beginner or any thoughts on the Camino De Santiago as I´ve read many mixed opinions. Assuming that you're walking from accommodation to accommodation, which is my style of walking, then the availability of hotels and other such places and the climate are the key things to think about. April is a great month in Spain, it's not too hot and the short but beautiful spring will be at its best. Accommodation is still great value there. I would look at the GR7 in Andulucia, chunks of the GR1 (you could buy my guide from the Cicerone web site) or the GR10. I would avoid the high Pyrenees, April is still a bit early. The Camiño of course is popular and fun but the scenery doesn't compare with the routes I've mentioned. Hope that helps and good walking! Brilliant, thanks for the advice. Another quick one; do you think it would be too early to then start the GR5 South- North in May? The GR5 runs through the Western Alps and walking in the high Alps doesn't start until well into July. There is a GR5 guidebook by Paddy Dillon for Cicerone that will help. You could definitely walk the Massif Central in May but not the Alps.